Another New Comic Book Day is upon us! It’s time to plan out your next trip to your local comic shop and take a look at this week’s new comics! Hit the jump to check out reviews of my favorite comics coming out this week. A new era begins as award-nominated writer Marguerite Bennett (Batwoman, Animosity) and artist Simone di Meo (Doctor Who: The Tenth Doctor) introduce an all-new Power Rangers team unlike any other! What is the secret behind this new team, and what ancient evil threatens the future? After the end of Shattered Grid, a massive crossover event the likes of which Power Rangers fans have never seen before, where else is there to go? Instead of snapping everything back to normal, these comics are continuing through to reaches unknown. This premiere issue in the “Beyond the Grid” storyline introduces us to our team of six new Rangers, random strays from across the shattered multiverse. But the issue is actually more about Grace, the former Red Ranger from the disastrous moon mission of 1969. Having never lived down that failure, Grace continues to anguish as she strives to complete her rescue mission and never lose another Ranger again. The phrase “Beyond the Grid” refers to our new setting, a mysterious Negative Zone like area beyond all existence. Whatever new realities were created at the end of Shattered Grid are irrelevant here. The crew of the Prometha, a mishmashed collective of Rangers both with and without their powers, are on a Lost in Space journey to survive this mysterious land and find a way home. Andros, one of the Rangers with his powers mostly intact, has his own subplot set up here between his sister Karone. Andros comes from a point in his series where he has yet to find his sister. Karone, however, comes from later in the timeline where she is already a Ranger in her own right. Despite still having her powers, Karone is not a member of the official new team - I suspect a tragedy is to come. The highlight of this series is, as with Shattered Grid, the interactions between different Rangers from across the franchise. In addition to the main six, a couple dozen other Rangers are present, albeit without their powers. There are plenty of little cameos here and plenty of interactions - too many for this review to cover them all. Beyond the Grid is already promising to be a fun and interesting event for fans of the entire Power Rangers franchise. I do question if fans of “just” the original series will stick around, but I suspect the events of Shattered Grid have swayed many to explore the rest of the series. I’m ready for the crossover events to keep coming though! Billy Bane is a prophet who got it all wrong, and the galaxy has been burning ever since. All he wants is to waste away in the darkest corner of space with his best pal Dust, a supercharged Fuq bot. But when a new prophet comes calling, Billy is summoned to save the galaxy he's at least partially responsible for destroying. This space opera series by Michael Moreci (Black Star Renegades) and Hayden Sherman (The Few) is a fun and wild throwback to Star Wars, Firefly, Guardians of the Galaxy, and more. 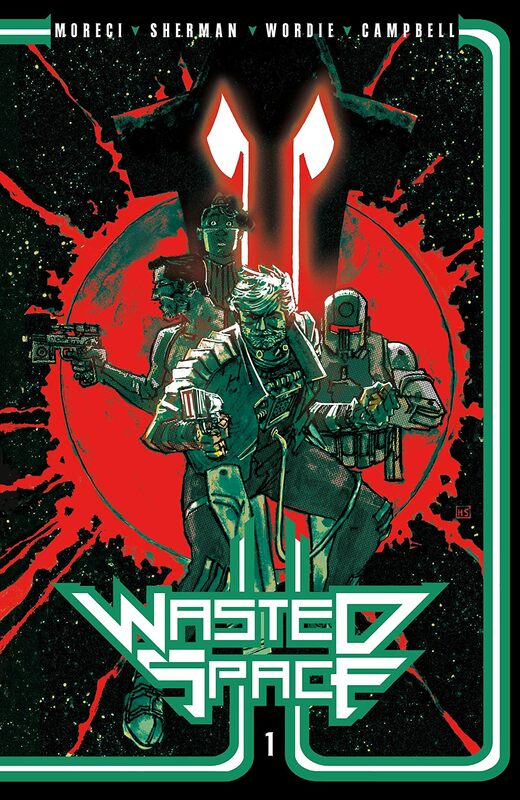 But Wasted Space isn’t just another adventure story set in the stars where rogues shoot lasers at each other. It’s an epic story that’s hiding something greater. When I was a kid, it seemed like every PS2 game I played had the same villain: an evil religion. It must have been the times because today every game is about bringing down a corrupt government instead. Wasted Space is the best of both worlds. The main villains appear as a theocratical empire that literally no one wants. Our unlikely group of heroes set off on a mission to bring down the Emperor Pope. As I said, I got PS2 JRPG vibes from this. Even though it’s a comic I kinda wished there was a complicated turn-based battle system. The action that we do get is slick as hell and that’s totally all on Hayden Sherman’s great art. Wasted Space is a space opera that blends tropes from the past and the present to create a future that’s visually and philosophically profound on every single page. Get the first volume, collecting the first arc across five chapters, in stores this week or click here to order a copy now. As their fated match finally arrives, Nicholas is determined to get Seiji to focus on him and him alone. This is difficult when all Seiji can see in Nicholas is his estranged half-brother, legendary fencer Jesse Coste. Nicholas does his best, but Seiji wants him to be Jesse’s best instead. Meanwhile, Nicholas just wants to be taken seriously as a fencer. In the end, no one gets what they want. Well one of them ends up on the fencing team so in a way one of them does get what they want. The relationship between Nicholas and Seiji has, of course, been the best part of this series so far. They both want something so badly and they actually can attain their goal - if they work together. Also in this issue: we meet everyone’s parents. That’s always a good time! Fence is a western comic written and drawn in a very anime and manga style that makes a boring sport exciting. You can get Vol. 1 by clicking here, pre-order Vol. 2 here, and keep an eye out for the future as the story continues in graphic novel format after that! The Port of Earth is open for business to all galactic alien travelers, but as our alien business partners secretly visit Earth, an unresolved alien threat emerges and recently traumatized Earth Security Agents Rice and McIntyre must balance between protecting humans and alien visitors alike. The first arc set the stage and in this arc, the players storm the theater as the alien threat escalates and leads our agents into the one place no human has ever gone: the Port of Earth itself. Finally getting to see the interior of our titular location was so exciting and I never want to leave it again! The second volume in this thrilling political sci-fi series is in your local comic shop this week. Click here to pre-order it from Amazon. What comics are you picking up this week? Let me know down in the comments below!